Before his marriage to (and subsequent collaborations with) Catherine L. Moore, Henry Kuttner was a frequent contributor to the pulp magazines that specialized in the weird, supernatural, horror, and science fiction genre. Beginning in 1936, with the minor classic “The Graveyard Rats,” Kuttner launched a steady stream of short stories aimed at Weird Tales, Mystery Tales, Thrilling Wonder Stories, and others. Given the short lengths of Kuttner’s stories, he had to be prolific and he contributed reams of copy to the weird-menace (a sub-genre of horror where a seemingly supernatural plot is resolved with a pedestrian ending) pulps, Thrilling Mystery and Spice Mystery. It was his specialization for “spicy” or sexed-up stories that led Kuttner to write most (two stories and one novelette) of the first issue of Marvel Science Stories, arguably the first “spicy” science fiction pulp. TERROR IN THE HOUSE is the first volume in a set collecting many of Kuttner’s earliest stories, most of which have never been reprinted. I've just finished reading this massive handsomely made collection of Henry Kuttner's early terror and dark suspense stories. As I've mentioned here many times, Kuttner is my favorite of all thirties and forties pulp writers and this book demonstrates why. Just about every single trope of the terror magazines can be found in these stories. Kuttner was part of a group including Robert Bloch who incorporated its idol H.P. Lovecraft's work into their own. A half dozen of these stories reflect that influence. To me Kuttner was always at his best when he wrote dark. And these stories qualify as that. Plus they offer an interesting historical viewpoint of Depression America. Garyn G. Roberts writes a long and rich introduction. But it is Richard Matheson's shorter piece that contains one of the funniest stories I've ever read. Seems that in the late forties The Fictioneers--the group of pulp writers that later became legend--got into some kind of argument with another group of writers. Bill Cox (William R. Cox) and Bill Gault (William Campbell Gault) decided to go punch it out with them. I knew both of them and that is certainly within the realm of possibility. Kuttner insisted on going along. They were skeptical. This is a knock-out collection in every sense. And there is a second volume to come. Grab it now before it goes out of print. Haffner Press has done it again! A couple months ago, they published Henry Kuttner and C. L. Moore’s fabulous Detour to Otherness. Now, the Haffner Press has brought out the first installment of Henry Kuttner’s out-of-print pulp stories. This massive 712 page tome collects his work from pulp magazines that specialized in the weird, supernatural, horror, and science fiction genres. 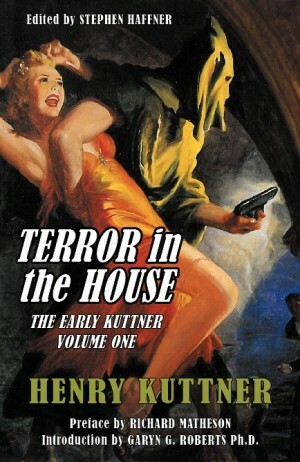 TERROR IN THE HOUSE is the first volume in a set collecting Kuttner’s earliest stories, most of which have never been reprinted. If you’re a Henry Kuttner fan, this is a must-buy! If you haven’t read any of Henry Kuttner’s wonderful stories, TERROR IN THE HOUSE is the perfect place to start. I can’t wait for Haffner Press to bring out the rest of these Kuttner volumes!